When dancer-choreographer Demetrius Klein learned he had won the $6,000 Randolph A. Frank Prize for the Performing Arts, he was shocked. To his surprise, “I think they got it,” he said of the judges. The West Palm Beach resident, who is a dance critic for the Palm Beach Daily News, established the Demetrius Klein Dance Company, his first Palm Beach County company, in 1986 to perform postmodern work that embraced the community and contemporary themes. His new company, DKDC/DIY Projects, formed in 2016, is even more community-based, he said. It performs work on a project-by-project basis in alternative venues, frequently tailoring the work to the site. Venues have included a bench on Clematis Street and the staircase of a West Palm Beach parking garage. Dancers can range in age from 10 to 60. 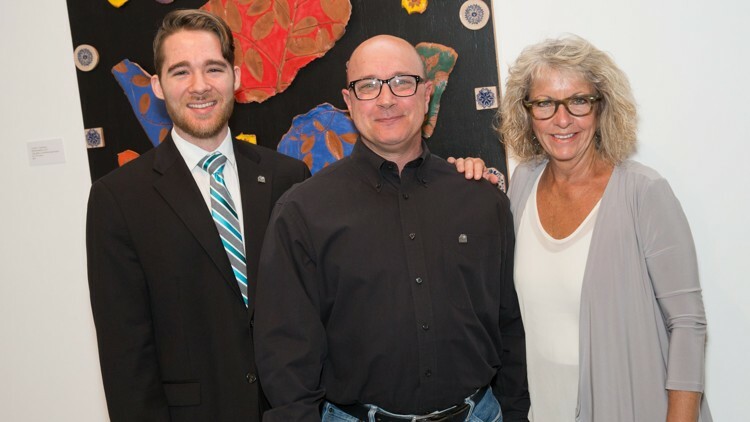 The award was among $18,000 in grants to individual artists the Cultural Council of Palm Beach County handed out last week during a luncheon at its headquarters in Lake Worth. Dylan Evans, of Delray Beach, took home the $2,000 Frank prize for emerging performing artists. He’s a choral singer who performs with Palm Beach Opera, Delray Beach Chorale and St. Vincent Ferrer Catholic Church in Delray Beach. He also teaches voice privately and serves on the Delray Beach Chorale board. The Frank awards recognize artists who enrich the quality of the performing arts in Palm Beach County. Debra Yates, of Lake Worth, will use her $10,000 award from the Dina Baker Fund for Mature Female Artists to help pay for converting the carport of the cottage she moved into recently into a studio. She hasn’t been able to paint for six months while the work was under way. She’ll also spend the money on art supplies. She has in mind a series of 12-foot paintings. The prize goes to a Palm Beach County female artist 60 or older who demonstrates artistic merit and financial need. It comes with a solo show, which will be held April 28-May 26 at the Cultural Council. Demetrius Klein is back on the local dance scene after five years in his native Ohio and it’s almost like he never left. He’s still putting on modern, original performances in unexpected spaces and creating works that nobody else but the acclaimed, award-winning choreographer would dream of. If you’ve seen Klein’s previous works — which have drawn him fellowships from the National Endowment of the Arts as well as MacArthur Foundation grants — then you know that he tells more with movement, music and imagery than he often does with words. Adding to the imagery in “Elbow” will be prints by Japanese folk artist Sadao Watanabe, which are on display through December in the church’s so-called Great Big Room, where Klein’s performance will be presented. Tickets: $20 ($10 for students with ID and seniors).